Looking for a quick, light and healthy week day meal? 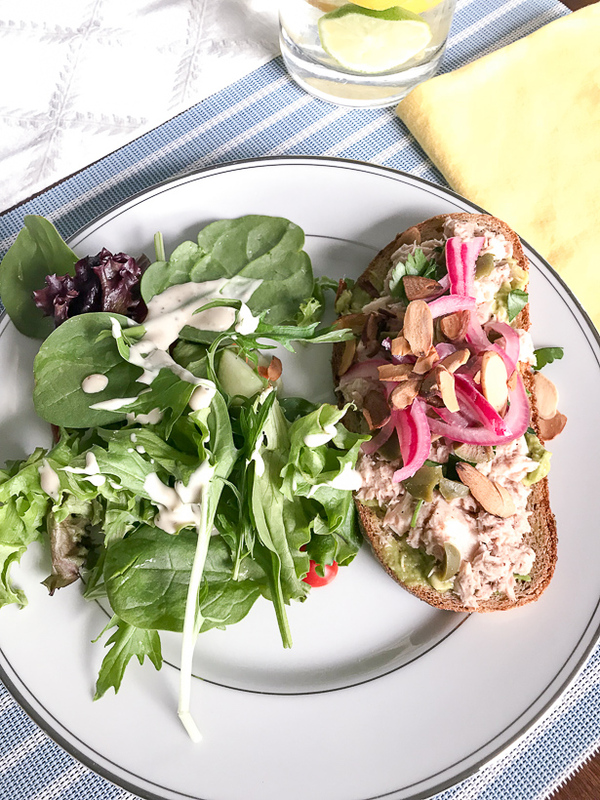 Try these incredibly simple but oh so tasty tuna avocado open face sammies with pickled onion and almonds! We tried the most delicious tuna and avocado open face sammies this week! They were so delicious we ate the entire batch, and I just had to share the recipe with you lovely peonies! The recipe came from Cooking Light, which I subscribe to, and this magazine is so worth a monthly subscription! 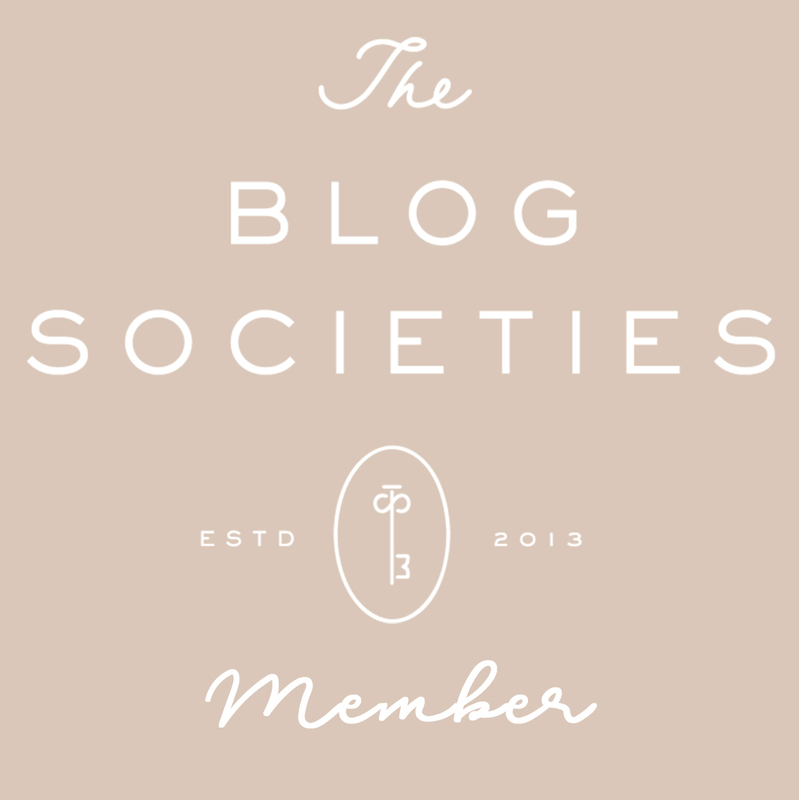 I love so many recipes from its pages. I modified the tuna avocado open face sammies’ recipe just a wee bit, adding a touch of mayo and red wine vinegar to the tuna mix and putting it on a whole-wheat sprouted bread. Also instead of cooking the onions, I fixed them in the morning before leaving for work and then let them marinate in the vinegar all day. The pickled onion on top of this sandwich really steal the show. They had a bright, tart flavor that compliments the velvety avocado and earthy tuna! Pickle the onions the morning or night before by mixing the vinegar, water, and sugar together in a tupperware container. Stir in the onions and set aside to marinate in the refrigerator. Toast the whole-wheat bread slices to preferred color and the sliced almonds. In a medium bowl mix together the tuna, mayo, and red wine vinegar. Set aside. Peel and slice your avocados. Scoop out a portion onto each bread slice and smash with a fork. Spread the tuna mixture on top. 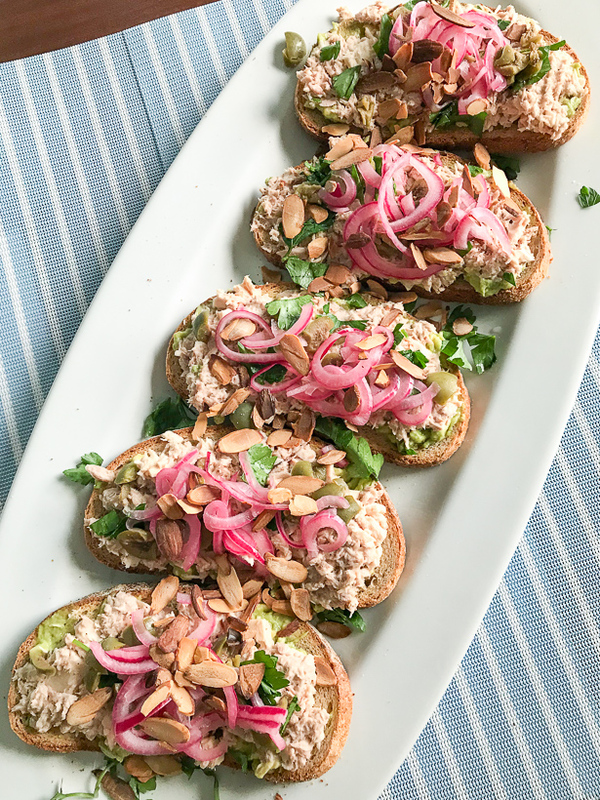 Add a spoonful of the pickled onions and then sprinkle the open face sammies with the almonds, olives, and parsley. Serve with a side salad and dig in!